This morning, meet your Tour Director and commence your journey towards Edinburgh. Along the way you visit the world famous Old Blacksmith’s Shop in Gretna Green. You continue further north into the city of Edinburgh, here you visit the famous Edinburgh Castle. Descend on Castle Hill and walk along the cobbled Royal Mile, seeing St. Giles Cathedral and its crown shaped spire and further continue past the Queens Palace of Holyroodhouse. After breakfast, you head north over the Forth Road Bridge. You stop at the Pitlochry famous for producing wool, to visit the Scottish Whisky distillery and get the opportunity to taste the finest whisky. Later you continue your journey passing the Cairngorm Mountains to Inverness. If time permits experience an optional train ride up the mountain. Today you continue your journey to Glasgow with a photo stop near the Urquhart Castle. You visit the scenic Loch Ness, this is home to the famous legend of Loch Ness Monster – Nessie. 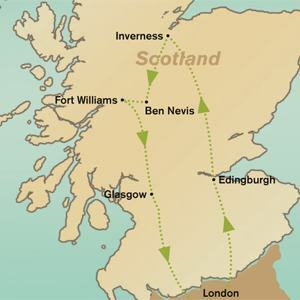 Thereafter, drive to Spean Bridge for a photograph opportunity of Ben Nevis, later you experience a cable ride on Nevis Range, Britain’s only mountain gondola cable car. You continue to Fort William for some free time for shopping. You then travel through the Rob Roy country and journey to Glencoe, the infamous site of the 1692 Massacre and head towards Loch Lommond and into Glasgow. Upon arrival in Glasgow embark on a city tour to visit the Cathedral, City Chambers, George square & the famous University of Glasgow. This morning you head towards the Lake District, UK’s largest National Park. A popular holiday destination, it is famous for its lakes and mountains. Here you will take a cruise on the scenic Lake Windermere.